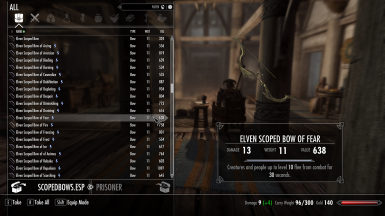 Replacer .esp for Scoped Bows that updates the leveled lists to run along WACCF, adjusts some stats, and adds vanilla enchanted versions of the bows. 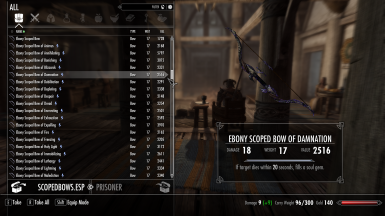 This is a simple replacer for Scoped Bows that I made for myself. > Adds enchanted versions of the bows throughout the leveled list corresponding to vanilla tier. > The leveled lists have been adjusted to match the changes from WACCF. > Some overall stat changes, such as: equalized damage, more crit damage, value adjustments, and name changes to fit with enchantment names. - These are the values I thought fit for myself, you can always load the .esp in xedit and change them to your taste. - Because I made slight edit to ~1-3 entries the esp now requires WACCF as a master.